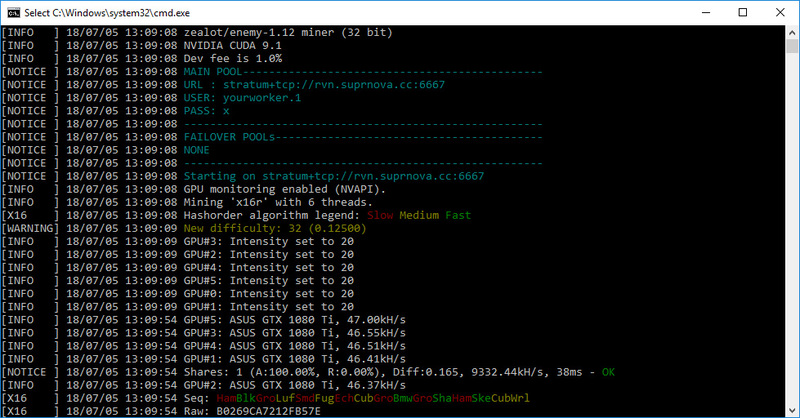 There is a new version of the popular closed source miner z-enemy-1.11 for Nvidia GPU mining rigs that is widely used for X16R coins such as RavenCoin (RVN), though the miner also supports quite a lot of other algorithms in the more recent versions. 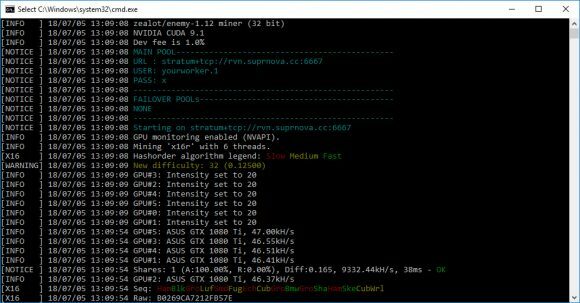 The latest release 1.12 add support for two new crypto algorithms – Sonoa and PHI2, and also brings slight performance increase in a number of already supported algorithms: X17, X16r, X16s, C11, Bitcore, Aeriumx and others. So if you are using the z-enemy miner you might want to update to the latest version of the software. We remind you that z-enemy is a closed source miner available only as a binary release and it contains a 1% developer fee built-in to support further software development. There are binary releases available for both Windows and Linux, the official download links are posted below. The Windows binary release is available as CUDA 9.1 and CUDA 9.2 compiled executable, so make sure that you have an up to date driver in order to avoid having issues. Linux binaries are compiled for CUDA 9.1 for the moment and should work fine out of the box on Ubuntu and HiveOS.